Meet "Fuzzy" The Spotted Dog from GUND. Extra soft and extra floppy, "Fuzzy" is the ideal companion everywhere you go! 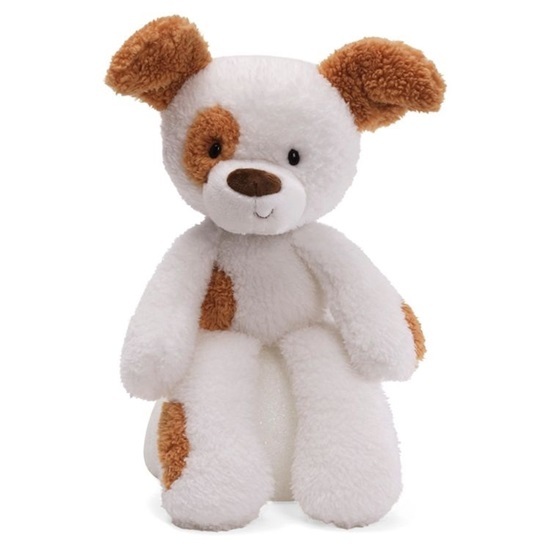 This is a 13.5-inch white plush dog with light brown spots on his arm, leg, stomach, and over his right eye. His ears are a soft, floppy brown. He has black safety eyes and a dark brown, soft nose, perfect for kissing! His soft little tail is also a light brown . "Fuzzy" has pellets in his bottom to help him sit up unassisted. "Fuzzy" is good for ages 1 and up.